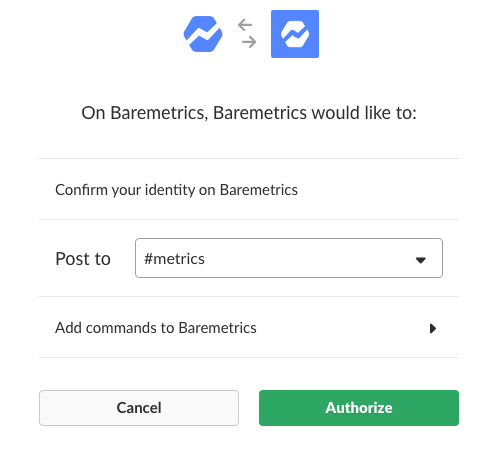 With Baremetrics Slack integration you can send important updates to your team's Slack channel such as MRR, LTV, Churn, New Customers, Cancellations and more so nothing falls through the cracks. Get both instant notifications of important events as well as daily, weekly and monthly summary reports all right in your team's Slack channel! Head to the Slack Integration portion of the Settings page and click Connect. 2. Sign in to your Slack account when prompted. 3. Agree to the fine print and choose a destination channel. Note: Recurring reports will only be posted to one channel, but you can call upon demand reports from any channel. Recurring reports are posted daily, weekly and monthly. You can choose which metrics are included in each from the Slack Integration portion of the Settings page. A whole whack of instant notifications can be enabled on the Slack Integration portion of the Settings page. This is where things get way cool! 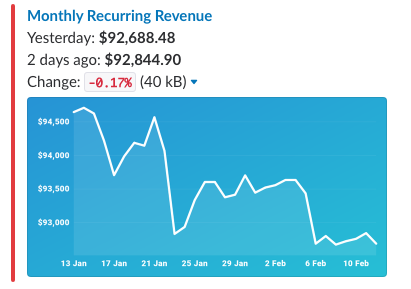 You can bring up entire reports or specific metrics for daily, weekly, and monthly intervals. If you ever forget what commands are available, just type /baremetrics to get all of this info right in Slack. Omitting the interval will generate a daily report. Omitting the metric will generate a report made up of all the metrics that were chosen when you configured recurring reports.